A wonderful hand crafted period flush fitting ceiling light, with a nickel plated solid brass mount and short drop rod supporting the shade. 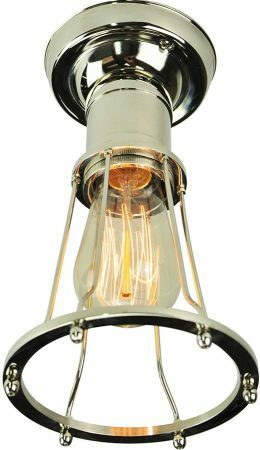 The shade has a polished nickel cylinder upper gallery and flared open cage encasing the supplied period style vintage squirrel cage lamp bulb as shown. An elegant replica flush fitting ceiling lamp that will enhance and add true character to your period home.